Earlier in the week the disastrous access road proposed to connect to Stymiest Street in West Amwell was described. There PennEast proposed to build a temporary construction road charging straight up the mountain and cause severe runoff and erosion issues. Not to mention it was connecting to a tiny one lane gravel road that in turns connects to tiny Quarry Street in Lambertville. 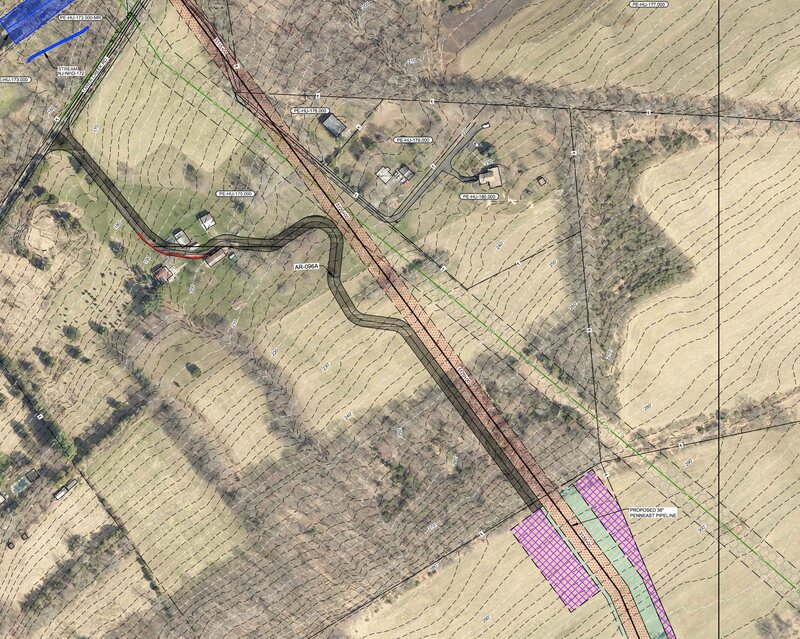 That dark gray wavvy line is the proposed road. You can see it snaking between the farm houses and buildings on the farm, then running along the pipeline route and terminating at the HDD staging site. This is a typical country farm one-lane driveway. They’re going to expand this to be 50′ wide, taking out trees on both sides. Look back at the plans, and you’ll see it running within about 10′ of their farm house. It runs right across their fields, making them useless. The HDD itself goes down about 80′ – right at the level of everyone’s wells in the area. TC tells me it’s going right through some wells. As a final insult, all this information came out AFTER the DEIS was issued. So TC and Joe don’t even have an opportunity to comment or object in the official process. Sad to say, but I believe that this was done in retaliation because tc and Joe have been so vocal and tenacious. I also believe that it is intended to send a message to all of us who fight for our land. PE can say, “If only you had listened to us when we asked you to sit down and talk together, this could have been avoided”. I am afraid that more shoes will be dropped as we go down this path but there’s is no going back now. If anything, it will serve to strengthen our resolve.